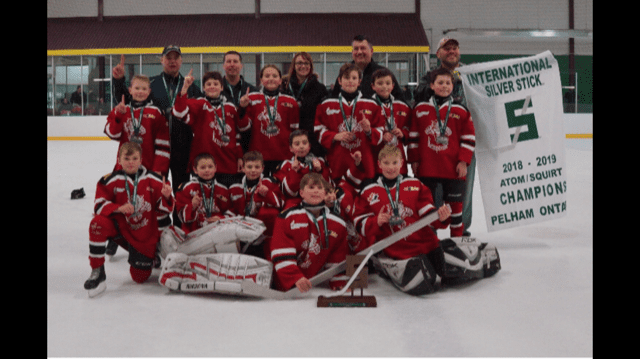 If, to a group of 9 and 10 year olds, competing in an international hockey tournament is like eating an ice cream sundae, the Kemptville Panthers Atom B1 Team were able to put a sterling silver cherry on top. For only the fourth time since 1976, a Kemptville minor hockey team walked away from the International Silver Stick Tournament as champions. The Kemptville Atom B1 Panthers team qualified their way into this tournament by outscoring their opponents with an impressive 49 to 5 margin, and finishing with a 5-0 record at the qualifying tournament that was held in early December in Haliburton, Ontario. Kemptville was tested in their first game against a strong Boulder (Colorado) Bisons team. Though Boulder played a heavy game, Kemptville dominated the play, possessing the puck for most of the match. The Panthers were unable to convert on scoring chances until Blake O’Brien buried a cross crease pass from Brady Nichol late in the second period. Boulder, unfazed, came right back to tie the game on a rare rebound from Kole Wollenschlager, who was rock solid for the Panthers in the 1-1 draw. The Panthers were matched against the Lambton Shores Predators (Southwestern Ontario) in their second contest. Kemptville got off to a quick start, and Will Traynor was perfect in net as they beat the Predators 3-0. After the game, Panthers Assistant Coach Kurt Repple said, ‘We played a complete game and I don’t think we lost a race to the puck all game. It was a great effort from the whole team’. Kemptville wrapped up round robin play against the Barrie Blue Thunder. Barrie was undefeated in league and tournament play coming into the Silver Stick tournament, and it didn’t take long for the Panthers to find out why. Barrie took advantage of a slow Kemptville start and set the tone for a fast paced game. Kole Wollenschlager was called on early and often to defend the Kemptville cage. Barrie opened the scoring early in the second frame before Karson Amaro woke the Panthers bench up with a well-placed point shot that found the back of the net. Barrie and Kemptville traded chances and goals and in the dying moments of what looked to be a 2-2 tie in the making, Lucas Booth got his stick on a loose puck in front and buried the game winner. The Panthers held on to hand the Barrie Blue Thunder their first loss of the season, 3-2. Kemptville would finish 2nd in Pool A, and that drew the Dresden Jr Kings (Southwestern Ontario) in a Quarterfinal match up. Assistant Coach Brad Compton offered ‘We have played some good hockey so far. Our defence has been tested but have been solid and our forwards are moving the puck and seeing the ice well, so, we think the scoring will come.’ The Panthers scored early and scored often in a 9-2 quarterfinal dismantling of the Jr Kings. The Blue Thunder had not forgotten their meeting with Kemptville from the day before, and they came out flying. Both teams held each other in check until Josh Repple broke in on a partial breakaway and made no mistake, giving Kemptville a 1-0 lead half way through the 2nd period. Kemptville added another goal to open a 2-0 lead, but Barrie finally managed to squeak one into the Kemptville net on a 6-on-4 power play in the dying seconds. It would be too little too late, as the Panthers secured a 2-1 victory to hand Barrie its second loss in 36 hours and secure a spot in the Championship game versus the San Jose Jr Sharks (San Jose, California). In the championship final, the Sharks and Panthers faced off and, although Kemptville carried most of the play, the San Jose net minder was up to the task and kept the score tied 0-0 after the first period of play. The Panthers were unrelenting, and this effort finally paid off when Brady Nichol broke in past the defence and backhanded a puck over the sprawling San Jose goaltender. Once Kemptville opened the scoring, they didn’t stop, routing the Jr Sharks 11-2.